Having dental crown and bridge can result in improved tooth appearance and reinforcement of the structure of your tooth. Dental crown and bridge is made of different materials including all-ceramic, zirconia or ceramic with metal or gold alloys and metal alloys. A dental bridge is one of a number of alternatives for replacing missing teeth. A bridge replaces a missing tooth by taking support from two or more adjacent teeth. Support and protection to compromised teeth. Restoration of normal, or improved, function. It takes 2 sittings for a crown and 2-3 sittings for a bridge. 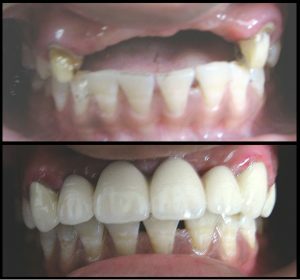 At the first appointment, in case of a dental crown, the tooth in question and in case of a bridge the adjacent teeth are reduced to make room for the artificial crowns. An impression (mould) is then made for fabrication in the laboratory. A plastic temporary bridge can be fitted (if required) for the interim period. A trial on the second appointment may be done in case of a dental bridge. Laboratory fabrication takes approximately 2-3 days. At the subsequent visit, the temporary bridge will be removed and the final dental crown/bridge permanently cemented into place. What is the latest in dental crown and bridge? The material used today is completely metal free (all ceramic), providing a pleasant and natural smile which completely matching your natural teeth. Today, even the dental crown or dental bridge is made in a CAD CAM process thereby eliminating any human error. You can ask your dentist at SmileSense Dental Clinic for more details.